THE UNIQUE OROGRAPHIC feature known as the Pamir Knot takes its name from the mountains on which it is centered, the Pamir. The “knot” refers to the convergence of some of the world’s major mountain ranges, including the TIAN SHAN, Karakorum, Kunlun, HINDU KUSH, and Pamir systems. The origin of the word pamir is unclear, although the Tajik name for the region is Bom-i-Dunyo, or “roof of the world.” Other sources claim “feet of the sun” and the high altitude grasslands of the region as sources of “pamir.” While a number of countries claim to be home to the Pamir Knot, it is actually centered in the Gorno-Badakhshan autonomous region of eastern TAJIKISTAN. Fringe areas extend into AFGHANISTAN, PAKISTAN, CHINA, and KYRGYZSTAN. In terms of relative location, the Pamir Mountains region remains one of the least accessible areas in the world. High peaks of the Pamir include Communism Peak (24,590 ft or 7,7495 m), Lenin Peak (23,403 ft or 7,133 m), and Peak Evgenia Korjenevskaya (23,311 ft or 7,105 m). In terms of mountaineering, these towering peaks have been scaled a number of times, although lesser peaks of the Pamir remain as yet unconquered. Considerable temperature variation exists within the Pamir region, with winter daily lows ranging from 1 degree F (-17 degrees C) in eastern areas to 21 degrees F (-6 degrees C) in the west. The Pamir region is heavily glaciated, including Murghab Pass, which stretches for 144 mi (231 km). This mountain region is also home to a number of geopolitically important features. The Karakoram highway, linking Gilgit with Kashgar, is the highest international highway in the world. The Wakhan Corridor, a narrow corridor (as narrow as 10 mi or 16 km) running through the Pamir mountains between Tajikistan and Pakistan, can be seen on political maps as the eastern “finger” of Afghanistan. This corridor was an annexation to Afghanistan by Great Britain in the late 18th century. The main purpose of the Wakhan Corridor was to thwart Russian advances toward British India during the Great Game. The Great Game, waged throughout the region, was an 18th century Cold Warstyle conflict between Britain and Russia for control of Central Asia. The Wakhan Corridor effectively separated British and Russian territory. 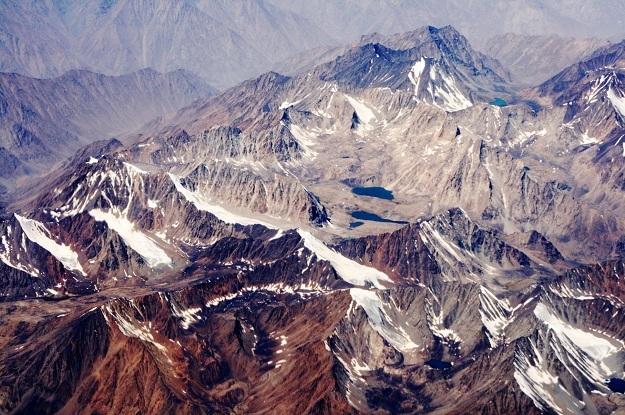 The Tian Shan mountain range radiates north from the Pamir Knot through the border region of Kyrgyzstan, Kazakhstan, and the western Xinjiang region of China. The range includes Pik Pobeda, the highest point in Kyrgyzstan, which rises to an elevation of 24,407 ft (7,439 m). The lengthy Kunlun mountains stretch for 1,863 mi (3,000 km) through western China, south to the Pamir Knot, and northeast through northern tibet. The Kunlun range includes Kongur Tagh, rising to an elevation of 25,326 ft (7,719 m). The Hindu Kush mountain system stretches for over 559 mi (900 km) through eastern Afghanistan, forming much of the boundary with Pakistan. Notable peaks include Tirich Mir (25,230 ft or 7,690 m) and Noshaq (24,581 ft or 7,492 m). The Karakoram, stretching for 310 mi (500 km) through the border region of Pakistan, India, and China, is the westernmost range of the himalayas.